Student Finds New House Dirty & Damaged – With Hair In The Carpet! When you move out of student halls and into a house for the first time, you’re bound to be excited. It feels like striking out on your own for the very first time! 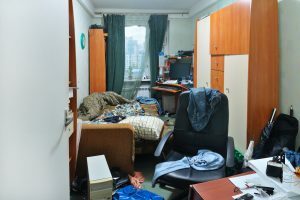 Unless, of course, you’re 20-year-old Bristol University student Sam Taylor, who came to find his new student digs dirty, damaged and with hair worked into the carpets, the Bristol Post reports. You’d hope that the people leaving the house would get a team of professional cleaners in to get it ready for the next group to be living there – and you’d certainly expect the landlord to make sure the house was habitable before renting it out to someone else… but in this case, it appears that neither of these actually happened. Removing hair from carpet can be tricky – but it can be done. Try spraying water and fabric softener onto the carpet so it clumps together, then brush with a stiff brush. Pick up the resulting clumps and throw them away, then vacuum over the carpet to collect any stray hairs. Alternatively, give Wirral carpet cleaning company Metroclean a call to see how we can help you bring your house back to life. This entry was posted in Uncategorized and tagged Wirral carpet cleaning. Bookmark the permalink.